Habitat: In winter, American white pelicans are found on large lakes and reservoirs, the Mississippi River and its backwaters, and coastal estuaries and bays in Mississippi. It breeds mainly in the Northern Plains of the United States and Canada. A resident population is found in coastal Texas. Non-breeding birds are found all year along the Lower Mississippi River. Status in Mississippi: Fairly common migrant and winter visitor in Mississippi. Hundreds of birds can be found in one flock. An estimated 200,000 adult American white pelicans are thought to exist in North America. The number of breeding colonies and adults are thought to be increasing. Diet: Eats mainly fish. 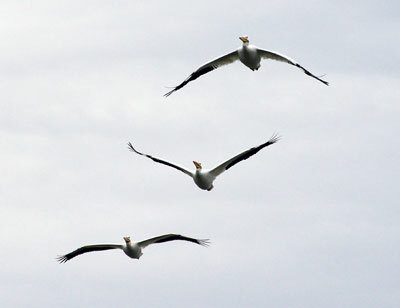 They do not dive for food like brown pelicans but feed cooperatively on the water’s surface. White pelicans have been known to feed at catfish farms. Appearance: One of the largest birds in North America, having wingspans of 9 feet or more. Mainly white with black wingtips and trailing edges of wings. It has a large yellow bill. American white pelicans are graceful in flight and sometimes fly in “V” formations.